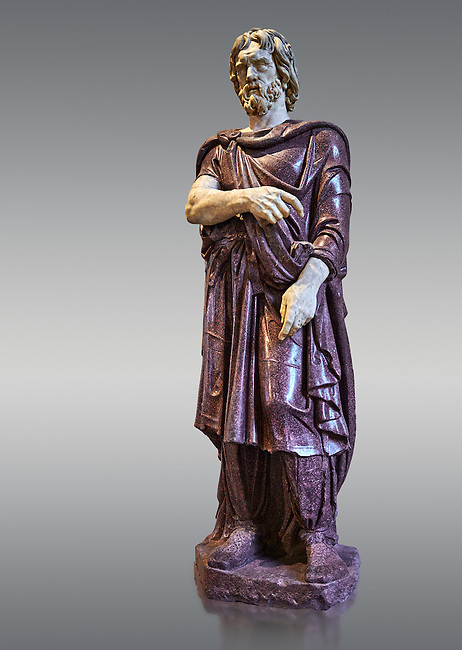 Statue of a Captive Barbarian - a 2nd century Ad Roman sculpture made in Porphyry and white marble from Rome, Italy. Restored by Pietro Benini brother of Bernin. The head and hands do not belong to the statue. The head is wearing a hat Phyrigian hat and recalls the same style as the famous Farnese Prisoners statues who were defeated Dacians from the Forum of Trajan (98-117 AD). The statue was from the facade of the Villa Borghese. The Borghese Collection Inv No. MR 331 or Ma 1385, Louvre Museum, Paris.